Below you will find a list of all the All Slots Casino bonuses - offered to new players. The right side offers a casino overview (click to scroll through the images). When you get yourself involved in online gaming, you really want to seek out the kind of people with enough experience to assure you that your needs are going to be taken care of. And that is what consumers have come to expect from All Slots Casino, which has been serving the needs of Canadian casino gaming enthusiasts for over a decade. This is a truly international casino, where folks from the UK, Australia, Spain, Italy, Germany, France, Canada or the Netherlands can call toll-free for the customer service department, which is open 24 hours a day, and you will find when you take a look at this website that it is among the most "user-friendly" you'll come across. In early 2014, Grizzly Gambling conducted an exclusive interview with one of the company's Brand Managers who disclosed that it's most serviced Canadian provinces are Ontario and Quebec, but it is servicing players across the country including remote locations in the NWT! Not only does the company service patrons online, Casino AllSlots will mail (and in select circumstances, hand-deliver) it's loyal customers gifts and rewards as you would expect from a Las Vegas casino. Quite impressive for an internet-based company. One of the terrific things about coming to Casino All Slots is that you are going to be greeted by a tremendous bonus. It's a 100% match, good for up to CA$250 as well as 30 free spins to enjoy on Jungle Jim. This welcome bonus is not a single offer. Instead, you can continue to earn free cash as you make other deposits. The second deposit to the account will grant a 50% bonus for another $250 and 20 free spins to enjoy on Dragonz. The third deposit if a 50% match to $300 with 20 free spins on Pollen Party and the fourth deposit gets a 50% bonus worth $600 and 30 spins on Lost Vegas. This amazing welcome package provides any new player with an exciting way to get started and we find this to be one of the most rewarding bonus deals offered online. With the chance to get as much as $1600 and 100 free spins, there is no better way to get started playing real money games. All bonuses in the Welcome Package are subject to a 40x playthrough requirement and after meeting this, all generate bonus winnings can be withdrawn from the account. After you get started with your deposit and your bonus you can start to earn Loyalty Points for frequent play, and this is one of the fun parts, because those points can eventually be converted over to cash. Points are earned at different rates depending on what game is being played. One point is awarded for every 1 credit bet on slots, 5 credits on table games, 10 credits on Sic Bo and Roulette, 20 credits on video poker, craps, baccarat and blackjack and 100 credits on Classic Blackjack and All Aces Video Poker. As soon as you collect 5,000 points in the account they can be exchanged for casino cash at the tare of $1 for every 1,000 points earned. All Slots also has a great tiered VIP Program, where all players start at Silver and work their way to Diamond. Each level of the program offers more incentives, such as bonus birthday points, monthly loyalty bonuses, higher point earnings and faster withdrawals. Since All Slots is a class act, they have the very best in casino games for its players. In this industry, that means only one thing: a partnership with Microgaming to power the casino. 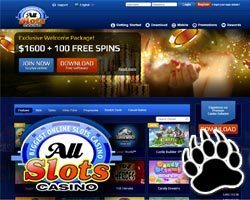 If you call yourself "All Slots" you know that you have a burden to provide the very best in online slot games, and that is most certainly the case, as there are over 400 slot games featured, guaranteed to satisfy anyone's style and level of play. Microgaming designs and develops the best slot games in the world, and they always come with the most features, like "AutoPlay," where you hit a few buttons and let the game play all by itself. 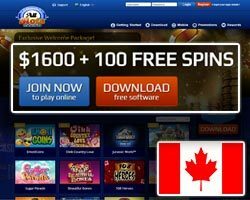 One of the first things that customers in Canadian provinces like Alberta, Quebec and British Columbia have realized is that AllSlots isn't all about slots. Because of their superior software hookup, they can offer the best table games to their customers as well. They don't skimp when it comes to variety either. One of the games where folks like to get some of this variety is in blackjack, which is why you can play Atlantic City and/or Las Vegas Strip versions of the game, along with Double Exposure Blackjack, Pontoon and many others. All of this comes through the "Gold Series" of games produced exclusively by Microgaming, which also includes roulette and Caribbean Stud. This full suite of games comes in a download, but there is an "Instant Play" version that can be used right through an internet browser. Now we realize that a lot of online casinos make that claim, but the difference here is that with All Slots, this no-download version is a lot more robust than most. You could literally conduct all of your casino activity, if you so wish, without ever having to download anything. Many players will want to enjoy games that are true life replications of what they find in their favourite land casino. Since Canadian players often visit local casino locations, they will be familiar with table and card games. While the online casino software does offer these standard games, there is something that is even more exciting and that is the offering of live dealer games. The live dealer games that are presented at Casino AllSlots include Baccarat, Single Zero Roulette and Blackjack. The games are streamed from the Microgaming studio and offer Betbehind, multiple betting options and various camera angles. As you know, there is a big move toward mobile gambling these days, and that is another spot where customers are lucky because of the Microgaming association. You will soon see the mobile casino, which is also very robust, advertised very widely on Canadian television, as this is an area of special concentration (they've already started it in the UK). And you don't have to open up a separate account to play on your smartphone or another mobile device! With the All Slots Mobile Casino, you can enjoy amazing games on the go and will find all the top-rated titles from the main online casino. To access the mobile app, players will have to download the software and they can then use iPhones, iPads, Androids and other devices to gain access to the titles that are supported. The games that can be found include a wide range of video slots and some table and card games. There are also video poker selections and instant win scratch cards that can be enjoyed for free and for real money wagers. When you want to open an account at AllSlotsCasino, you're going to have little trouble. When you go to the "Banking" page, you will be looking at a drop-down box in which you are presented with a number of deposit options that are particular to your territory. For example, if you go to "Canada" you're going to discover that Visa, MasterCard and Diners Club are available as deposit methods, as well as a bunch of alternatives that include Vanilla pre-paid cards, Skrill, UKash, Click2Pay, EcoCard, UseMyFunds, InstaDebit, ClickAndBuy, EntroPay, eChecks (electronic versions of checks), direct bank transfers and more. As I mentioned earlier in the review, customer service is available 24/7 to handle questions and complaints. The team is professional, polite and knowledgeable. There are different ways in which the support team can be contacted. You can instantly access support through live chat or Skype and there is also email and phone support. All Slots Casino has a license to operate from the Government of Malta and the site always follows local gambling laws to provide players with a safe and secure way to gamble online. In addition to a license, the casino is also eCOGRA approved, which will instantly let you know you can trust all games and services that are offered. The games are tested for fairness on a regular basis and the site published all verified payout rates. To make sure player information is always protected, the site uses encryption software when processing any transaction and all collected information is stored on a secure server. There is also some ways for players to control their spending and to ensure they era always gambling responsibly. The site offers the ability to set deposit limits and this can be done by visiting the casino cashier at any time or contacting customer support. There is also an Underage Gambling policy, where the site makes sure that no play is under the legal gambling age when they access games or create a real money account. Finally, AllSlotsCasino does have a self-exclusion option for those that may realize they have a gambling problem. There are three set self-exclusion periods, including 24 hours, 7 days and 6 months. Additional information regarding gambling problems and addictions can be addressed with the support team and the professional reps can refer players to sites that can offer more assistance in controlling their gambling habits. This is an easy one. As one of the Top 5 Microgaming casinos in the world, it's difficult to not to recommend this company to any of our visitors. It's ultra-popular for a good reason. Even though there is not a no deposit bonus, you can kick off the excitement with as much as $1600 in free casino cash along with 100 free spins on some of the hottest games in the industry. 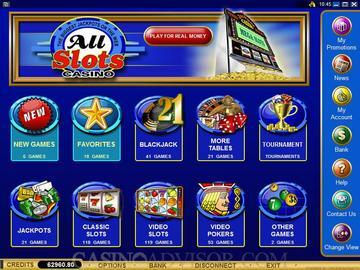 AllSlots is a preferred choice for Canadian players and remains one of the most trusted operating casinos online. Microgaming has just released the new Village People: Macho Moves slot at All Slots Casino. This branded slot features 6 reels and a stunning 70's disco theme. Canadian players will also be treated to a 100% match bonus up to $1,500. Promotional Ts and Cs apply. Travel to ancient Greece while playing the new Ancient Fortunes: Zeus slot at All Slots Casino. The slot comes equipped with 5 reels and 10 fixed paylines along with plenty of winning opportunities. Claim 100% bonus up to $1,600 at this casino brand to make it more memorable. Promotional Ts and Cs apply. Claim an exclusive 4-tier welcome bonus at All Slots Casino in January along with 100 free spins on each of your deposit. 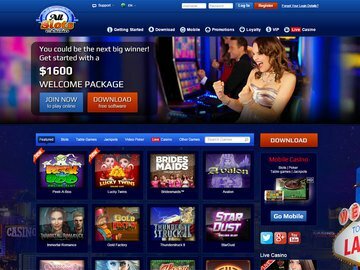 This online casino brand boasts with a remarkable selection of games from Microgaming along with an innovative user-interface, loads of payment methods, and more. All Slots Casino invites all Canadian players to enjoy an assortment of Microgaming slot titles this December. Register a new account and receive a whopping 100% match bonus up to $1,500. Promotional terms and conditions apply. Reel Talent is a brand-new slot set to be released at All Slots Casino in November. Newly registered players from Canada can look forward to an unforgettable 3-tier welcome bonus up to $1,500 to enjoy on this sensational new Microgaming slot. Terms and Conditions apply. With a phenomenal 3-tier welcome package consisting of $1,500 in bonuses, you can greatly increase your chances of winning when you play the new Wicked Tales: Dark Red slot from Microgaming at All Slots Casino. Ts and Cs apply. With over $15 million to be won in progressive jackpots at All Slots Casino, Canadian players can take advantage of $1,500 in bonuses over 3 deposits to boost their bankroll and become the next multi-millionaire with one single spin. Ts and Cs apply. 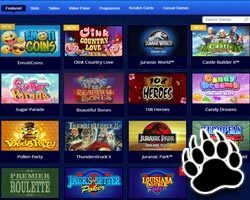 All Slots Casino has launched a new selection promotions in August, including regular free spins promos to try new games.. Play for your share of prizes by signing up for a 100% bonus up to $1,600 welcome package. All Slots Casino invites you to embark on an unforgettable gaming experience where you can win around the clock. Receive regular deposit bonuses, reload bonuses, free spin offers, slots tournaments and more. Simply opt in via your account or through the promotional offers sent via email. Embark on an Egyptian adventure at All Slots by playing the new Wild Scarabs video slot. Developed by Microgaming, the new Wild Scarabs slot comes equipped with 5 reels, 4 rows, and 243 Ways to Win. You can also look forward to free spins, additional wilds, and stashed wilds along with a top jackpot prize worth 1,733x your total bet. With more than 10 years in the online gambling industry, All Slots have more than 400 cool games that will surely give you hours of fun. They are offering a 100% bonus right now up to $250 and with 30 free spins. Looking for a true international casino? Head to All Slots where players come from all over the world. Discover games that replicate what land-based casinos have and enjoy every game with high paying prizes. Available on mobile phones, get an exclusive welcome package worth up to $1600 when signing up and playing an online game. Also win a progressive jackpot with the variety of slot games available only in All Slots Casino for a unique gaming experience. Play the games you love the most at All Slots Casino, earn rewards to fill up your progress bar, and get a free spin on the wheel of fortune every time your bar reaches 100%! Log into your account now for more details and get ready to win up to €400,000 worth of instant prizes. New Halloween® and Monster Wheels slots out now. You can play them for free by visiting the All Slots website today. Stay tuned for more game releases.